I love eBay for finding fantastic bargains and often pick up a lot of my costume jewelry online at a really low price. It doesn’t have to be great quality because I only wear it now and then and I know I will have a bit of a wait for it to arrive. I remember sharing my eBay bargain world map watch that I found on eBay and how much everyone loved me sharing my eBay bargain finds. In all honesty I had completely forgotten about ordering this item but when it arrived I knew I had to share it with you on the blog. I love this Dinosaur Skeleton Necklace, I just think it is so cool, so pretty and the best bit? it was only £1.41 with free postage. I can’t lie, it took a while to arrive, but it is so worth it. For the price the quality is fantastic, I’ve worn it several times already and it looks great with no breakages. The necklace is also available in silver and gold but I was drawn to the matte black finish. I loved the style and design of this necklace after attending a blogger Lush event at Meadowhall and the manager was wearing the Tatty Devine Black Dinosaur Necklace sold at ASOS. I google after the event and after seeing the hefty £125 price tag for the perspex necklace I thought no way. I can see that this is an exact replication but at nearly 100th of the cost it was a much more justifiable purchase and I don’t mind if it gets lost / broken / hardly worn. 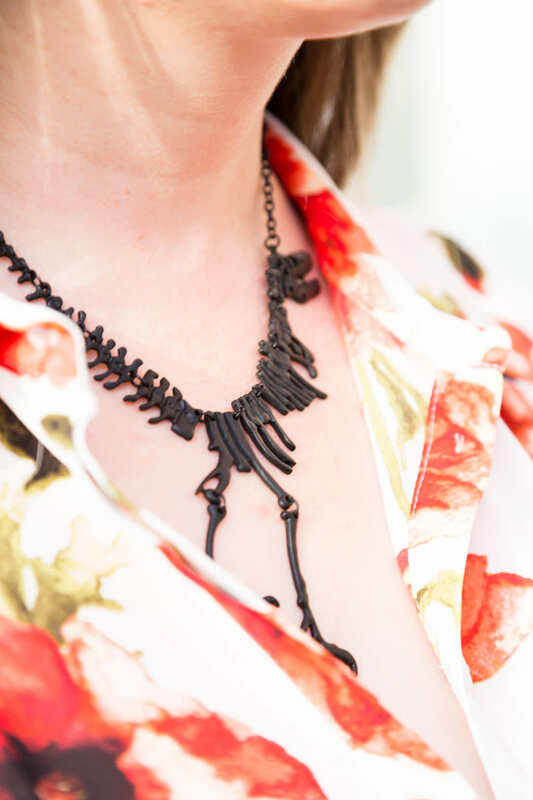 Let me know your thoughts on todays eBay Bargain – Dinosaur Skeleton Necklace post, is it something you’d buy? What is your best eBay bargain? Let me know in the comments below!